Whether you like disconnecting from the rest of the world or enjoying nature with your family, camping can be a beautiful, serene experience. But as breathtaking as nature is, sometimes an ice cold drink and a steaming hot meal are missed. That’s where having a portable generator for camping comes in. I’ve been camping with family and friends since I was a teenager and have gone through many generators – some great and some a complete waste of money. Fortunately, my experience can be used to help you find the best portable generators for camping. Here are my top picks to keep you and the campsite happy. Our top pick aims to please you at every turn. One of the outstanding features of this unit is its ability to start and run a 13,500 BTU RV air conditioner. Depending on where you’re going camping, being able to power on the air conditioner at night to fight off humidity is the reason why the Champion Power Equipment 75537i is our favorite. The features that matter most to a camper are often described in technical terms and abbreviations that look sophisticated but they do little more than confuse you. We broke down each component of the Champion so you can understand why it’s our top pick for the best portable generators that you don’t want to forget on your next camping trip. The Champion has 3,100 starting watts and 2,800 running watts to satisfy your needs. 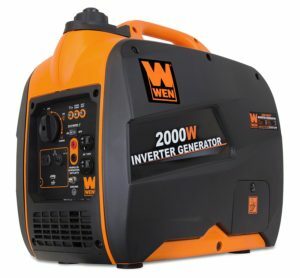 The reason the starting and running watts are so different is that when the generator is off and there’s no current running through it, it takes more power to start it. This is similar to when your air conditioner is kicking on and you hear the noise it makes before it levels out to a constant humming in the background. Anything that’s in a static position takes more current to get the motor started than it will to keep it running. The best part about this generator is that is can start and run a 13,500 BTU RV air conditioner with ease. It also has a 120V 30A RV outlet, a 12V DC outlet, and two 120V 20A household outlets. It’s ultra quiet operation produces a noise level of 58 dBA (A-weighted decibels) from 23 feet away. So, when placed outside at night, expect it to sound like a faint conversation in the background. It can run for up to 8 hours on a full tank of gas at 25% load. While it’ll get you through most of the night without you having to get it, be aware that running it on a higher load at night will significantly reduce its runtime. Its engine is a 171cc single cylinder OHV engine. Because OHV engines are so deluxe and have a stronger construction than other engine types, they’re more efficient, reliable, have excellent heat dissipation, and they also last longer. This means that they have fewer engine repairs. The Champion is extremely mobile, weighing 48.5 pounds that you can balance between the carrying and foldaway handles at each of its top ends. If you don’t feel like picking it up once you place it down, you can grab one of the handles and roll it in the direction you want it to go by using the wheel. This compact generator has so much going on in its 24.8 x 19.3 x 20.1 in dimensional size. For starters, it comes with a Volt guard so your sensitive devices are protected from sudden voltage spikes and power surges that can notably harm them. Also, it’s built for cold starts. Hence, you won’t have to sit in the cold struggling to start your generator when you would much rather be inside getting warm. This unit can hold 1.6 gallons of fuel and 0.6 quarts of oil. It’s recommended you use 10W-30 to get the best performance out of it. Its quick touch panel lets you easily access all your controls in one area. Some of the controls featured are a circuit breaker and indicator lights. The push-to-reset circuit breaker protects the generator against electrical overloads. The overload light lets you know if it’s overloaded and that it’ll reduce power to the receptacles. The output indicator light stays on as long as it’s operating normally. But if it overloads, the light goes off. The oil warning light has a built in low oil shut-off sensor. The Champion is an inverter generator and its sole purpose is to produce clean power that mirrors a pure sine wave. The electricity being generated is less than 3% THD, Total Harmonic Distortion. This means that it won’t affect the performance of your sensitive electronics such as the tv, lights, and anything with a microprocessor. It also comes with a smart economy mode that determines exactly how much power is needed. This reduces the electrical load so it can run quieter, extend engine life, and have a better fuel economy. Besides providing you with clean power, it also serves to make sure that the environment isn’t affected when your using it by being EPA certified and CARB compliant. The Champion provides you with a three-year limited warranty and full lifetime technical support. Its small wheels make it difficult to move on anything that isn’t sturdy. Don’t get me wrong, the wheels are super convenient. But they also make it hard to move around on dirt, loose gravel, or wet grass. Although you can’t change the wheels, you can always still use the two handles to move it from place to place. Have to take off screws to check the oil. To avoid it shutting down on you, you’ll need to check the oil daily to make sure that there’s enough. But, to check your oil, you need to unscrew the oil cover which is a bit of an inconvenience, especially if you don’t want to carry a screwdriver with you. Ironically, keeping a screwdriver handy is the best way to fix the problem. While it won’t power up your RV’s air conditioner, the Yamaha EF2000iSv2 focuses on pleasing you with its runtime and clean power. Although the Yamaha came in a close second, it’s still a powerful, reliable unit. We’ll explain the components of our runner-up for best portable generators in a way that won’t give you a headache. The Yamaha has 2,000 starting watts and 1,600 running watts. And while it’s not as extravagant as the Champion, you can still use it to run everyday appliances. It includes two 120V AC outlets and one 8A 12V DC outlet that you can use to charge RV batteries. At 120V, the rated AC current is 13.3 amps and the maximum AC current is 16.7 amps. So, in other words, at 120V, the Yamaha is supposed to run a maximum of 13.3 amps without any problems. Note that although it can go up to 16.7 amps, it shouldn’t because that classifies as an overload. However, if an overload does occur and it turns off, you can easily turn it back on by pressing the DC protector ON button. The leading component for this generator is its super-quiet muffler with a USFS-approved spark arrestor that produces a 51.5 dBA noise level. A 51.5 dBA resembles a quiet office when at 25% of a load and only 61 dBA when running at full load (the equivalent of a normal conversation). When camping, having a generator that gets the job done with minimum noise, especially at night, can make or break a unit. Or if you’re using your generator when in an emergency, the last thing you need on top of your stress is a loud generator that’s making as much noise as street traffic. It’s Smart Throttle also alters engine speed based on load. Engine speed increases with the more demand you put on the Yamaha. This improves fuel economy and reduces noise when the load is light. It’s run time is 10.5 hours at 25% rated load on a tank of gas. Therefore, you don’t have to worry about waking up, covered in sweat because your generator stopped working in the middle of the night. If you need more power than one Yamaha produces, then you can pair it with an identical unit to produce twice the power, up to 30 amps. However, you’ll need a twin tech cable which will need to be purchased separately. The benefits of using the parallel function are having twice the power without having to sacrifice the desirable features of a portable generator, such as a quiet noise level and it’s convenient size. Its 79cc, 4-stroke OHV, overhead valve, engine includes steel camshaft, valve train components, and cast iron cylinder liner. The Yamaha’s engine speed is 79cc, which translates to around 40 miles per hour. 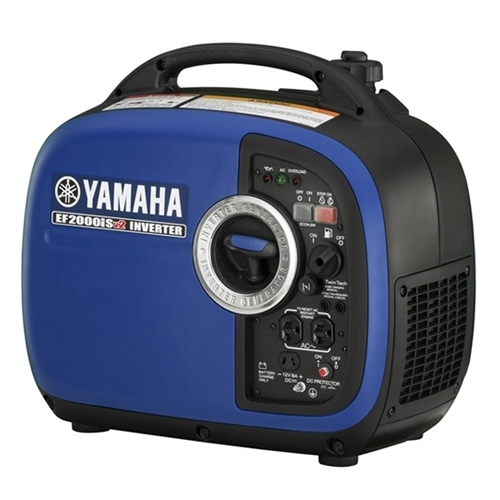 The Yamaha is a retro-cool, lightweight generator that comes in the colors blue and camouflage. Weighing in at 44.1 pounds, its dimensions are 19.3 x 11.0 x 17.9 inches. It can hold a maximum of 1.1 gallons of fuel. It doesn’t take up much room because of its size so it won’t be a hassle to find somewhere to put it. However, you should never try to use it inside or in an enclosed space. Its auto-decompress system is designed to reduce compressions for easier starting. Also, it’s auto warm-up increases engine speed when you first start it so it can handle appliances that require a lot of power immediately. The Yamaha also features an oil watch warning system, an electrical overload breaker, a fuel gauge, and a gas petcock. The oil watch warning system notifies you when your oil is low so you can avoid engine damage. Plus, it takes the guesswork out of when to refill your oil. The overload breaker prevents generator damage in case you experience an overload. For your added comfort, the fuel gauge lets you see how low your fuel is so you don’t have to worry about it running out at night. When you want to run the carb dry and avoid stale gas problems, you can use the gasoline petcock. The Yamaha is an inverter-styled generator with PWM (pulse width modulation) so voltage stability is between ± 1% and frequency stability is ± 0.1 hertz. An inverter produces high-quality steady power regardless of the load. The way it works is it outputs AC current, then it’s converted to DC and then back to a clean AC that produces a pure sine wave. The pure sine wave produces power that’s as clean as the power you get from your home. It’s also safe for the microprocessors that are found inside of your everyday small appliances. They’re safe in all 50 states and EPA and CARB compliant. The Yamaha offers a three-year warranty so you can rest assured that you’re protected if something happens to it. Easy to spill oil because of the way it’s designed. The oil system makes it nearly impossible to avoid spilling oil when you’re taking it out or putting it in. While you can’t fix a faulty design, you can compensate for it. When putting oil in or taking it out, you can use a funnel so that you can reduce oil spillage. Hard to start at times. It can take more than two pulls sometimes to get it started. However, if you tilt it forward a little, then try to start it, you’ll be able to use your unit a lot sooner. With some of the most unique features and lowest noise level, the Wen 56200i doesn’t disappoint. 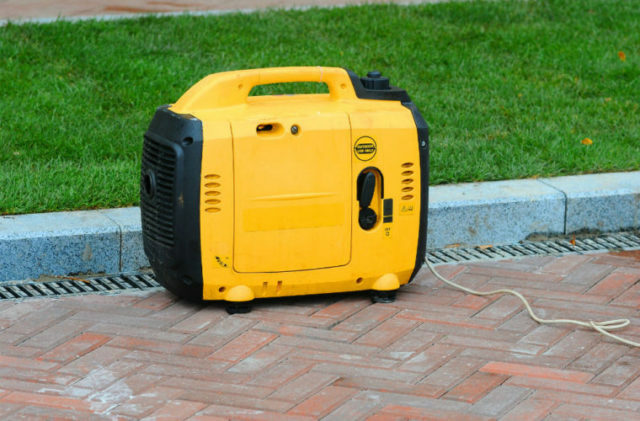 You’ll see why it made our list of best portable generators. Similar to the Champion and Yamaha, the Wen is a complex, yet simple generator that helps you experience the most from your camping trip. It has a starting power of 2,000 watts and a running power of 1,600 watts. It includes two three-prong 120V outlets and one 12V DC outlet. The unique feature of this generator is that it has a 5V USB port. It’s a thoughtful addition that lets you charge your phone outside. This is especially helpful if you decide to go tailgating with it. We’ve all experienced loud, obnoxious generators while alone with nature or at a campsite. To avoid keeping everyone up, this generator produces a 51 dBA noise level, which is quieter than a window air conditioner. The runtime for this unit is 6 hours at a 50% load. It comes with parallel connection ports that you can use to connect two generators to give you twice the power. It has a 79.7 cc 4-stroke OHV engine. Since it’s engine speed is similar to the Yamaha generator, it’ll run around 40 miles per hour. The best portable generators option is very travel-friendly, weighing 48 pounds and having a dimensional size of 18 x 11 x 18 in. You can carry it around by using its handle for added convenience. It also holds 1 gallon of fuel. The low-oil shutdown, overload protection, and low-fuel automatic shutdown control all ensure that the Wen is always at optimum performance. This generator is an EPA III and CARB-Compliant inverter generator with spark arrestors. It protects your appliances that are vulnerable to power surges and voltage spikes. It does this by providing you with clean power whose Total Harmonic Distortion is 3%. Besides clean power, the economy mode helps with fuel consumption by adjusting the motor to reflect the load. Although it only has a two-year warranty, they provide exceptional customer service. No problem you have is too small for them to help you with. Replacements, if needed, will be swiftly ordered. You can expect a moderately quick delivery. It only has one handle. It weighs 48 pounds, just like the Champion. The difference is that the Champion compensates for its extra pounds by giving you two handles to carry it with. Those handles allow you to evenly distribute the weight so you’re not putting much pressure on one arm. Even though having an extra handle would make the unit more convenient, it doesn’t take away from its charm. Hard to fill oil. The oil tube is really horizontal, so it makes filling it with oil difficult. You can easily solve this problem by slightly tilting it upward. 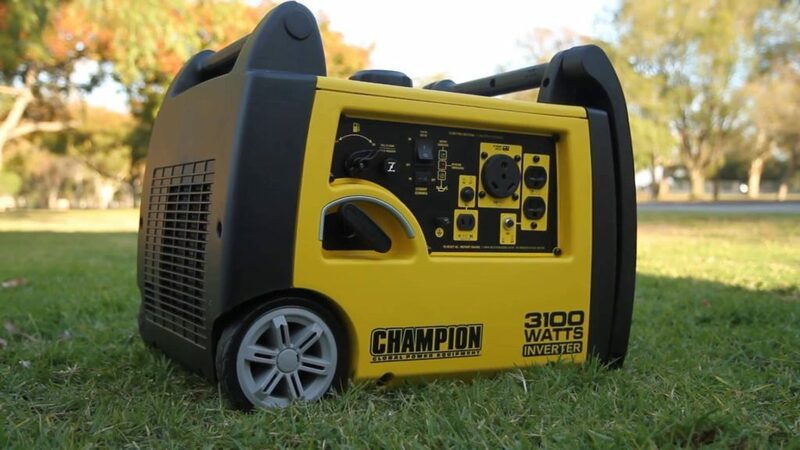 Portable generators are the perfect choice for a camping trip. You can take the luxuries you have at home with you while you enjoy a gorgeous scenery that the great outdoors has to offer. When you want to shut down and detach from the rest of the world, you can do so in one of these cozy, comfortable camping hammocks. If you’re trying to power your RV’s air conditioner then your best bet is the Champion Power Equipment 75537i. If you’re looking for something comparable but with added features such as a fuel gauge, you’ll love the Yamaha EF2000iSv2. Or if you’re really not looking to splurge but still want a high-quality generator, go for the WEN 56200i. Overall, when purchasing one of these best portable generators options, make sure that it fits your needs and the space you have for it. But no matter what you choose, your camping trip will still be amazing. Q: Will this power my entire house in the event of an emergency? No, but it can power the essentials such as the lights, TVs, fans, and one refrigerator. Although it can run an RV air conditioner, it’s not powerful enough to run a central unit. But it can run a 12,000 BTU AC. If you need something with enough power to run your entire house, you need a conventional generator. Q: What’s the difference between an inverter and a conventional generator? A conventional generator is one that has been around for decades. It’s the type of generator you picture when someone mentions they have a backup power system. Because they can produce a maximum power output of 50,000 watts and because of the amount of power being forced out by these types of generators, they’re not portable, quiet, or fuel efficient. Inverter generators are portable and focus on quieter operations. Their maximum power output is 4,000 watts. Because they’re designed for your convenience, they’re fuel efficient. There’s no denying that a conventional generator can get the job done, no matter what that might be. But you don’t want to hear your generator at night when you’re trying to get some rest. Or worse, you don’t want to alert and wake up the animals around you since it’s very likely you’re going to have to refuel in the night. This entry was posted in In Depth Product Reviews. Bookmark the permalink.